Savvy Spending: Tomorrow, 7/11, is FREE Slurpee Day at 7-Eleven! 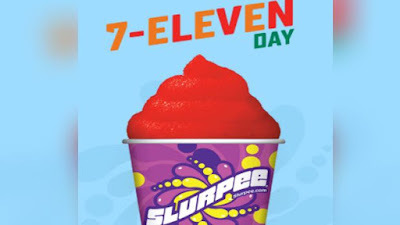 Tomorrow, 7/11, is FREE Slurpee Day at 7-Eleven! Tomorrow, July 11, is Free Slurpee Day! This year is 7-Eleven’s 90th birthday. Customers can join the tradition that was started in 2002 by receiving a free Slurpee! Just visit anytime between 11 am and 7 pm to receive a FREE Small Slurpee!